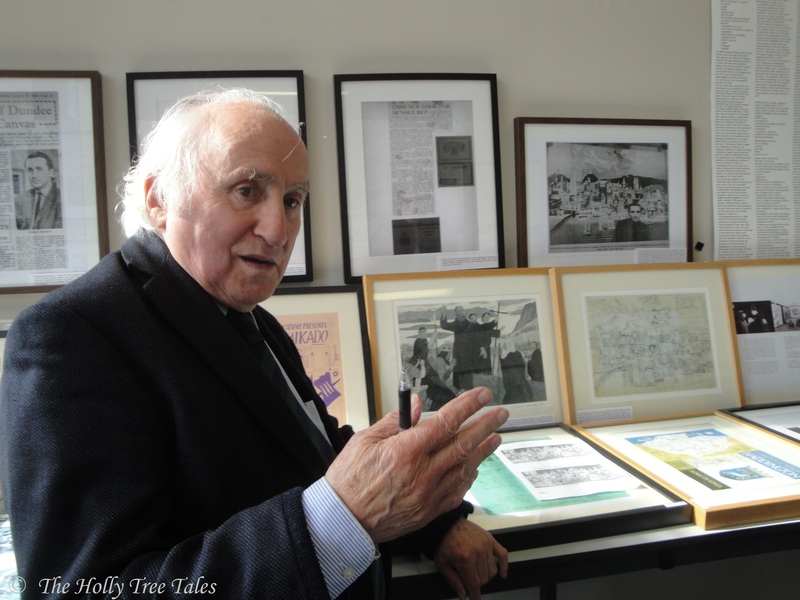 I am extremely privileged to know the indomitable Professor Richard Demarco (pictured above explaining his Archive at Summerhall), having first come across him in Edinburgh during the early 1990s, and am honoured to call Richard a friend. As is his wont and despite his advanced years, Richard Demarco continues to be immensely generous about sharing what he has with others, regardless of where he is or with whom, and he loves an audience with whom to engage. Ever enthusiastic about disseminating his vast knowledge, conveying his passion in every word, and describing his many encounters with bright and brilliant minds, all of whom he recognises as artists, Richard thrives on speaking with anyone who is interested to hear what he has to teach, and speaks with brilliance and compelling emotion about the things most dear to his heart. On one of my visits to Richard’s administration base in Edinburgh a couple of years ago, a small crowd had gathered, to whom Richard enthusiastically began to lecture. I switched on my camera to capture the moment in photograph, but hit the video setting, in error. Thus, instead of photographing him, I found I was filming the exceptional moment, which turned out to be fortuitious. Richard noticed that he was being filmed, but appeared not to mind the ‘intrusion’, so I kept the film running. To be honest, I wish I had video or audio recordings of every meeting and gathering at which we have met thus far, all of which have been fascinating, inspiring and intellectually vibrant. Richard Demarco is a stellar human being and one who never fails to enliven the world around him, a world which I am so fortunate to be able to encounter him in. I share this treasure of mine in good faith, the result of my impromptu filming of an impromptu lecture by Professor Richard Demarco, CBE OBE on 10 July 2013, at Summerhall in Edinburgh. The film clip contains mentions of the Edinburgh Festival, the climate and Nature, made poignant by the presence of a cherished portrait of the late Joseph Beuys, renowned artist and environmentalist, a much-treasured and missed friend of the great man. There are also several ‘guest appearances’ through a creaky door, by those going about their business of managing the Demarco Archive at Summerhall. I hope none will mind being featured in this little film. As an aside before ending this post, mere mention of the fact that this was filmed a day after Richard Demarco’s 83rd birthday. Richard has recently celebrated turning 85, and continues to travel widely to speak of Art, his great love, and many things related, inspiring all who come into his orbit. What a remarkable man he is! Note: For more information about Professor Richard Demarco, please search this site for other post(s), where you will also find links to his website. NB. The film clip featured is the property of and remains copyright to Holly Maxwell Boydell, with all rights reserved. The film and this post may be shared, but not used elsewhere for gain without prior and appropriate agreement / permission.